“However, we need to realise that young people’s view of success is often shaped by the society. If the Nigerian society is passing the signal that to be recognised means you have to be able to croon like Olawale, dazzle with the ball like Iheanacho, be a screen star like Omotola or crack peoples’ ribs like Julius Agwu, then we should be ready to have in our hands the challenge currently being faced by African-Americans in United States of America“. THE recently concluded MTN Project Fame has brought to the fore again the need to address the lack of recognition being suffered by Nigerian youths who go the extra mile in academic performance. The first prize winner walked away with N5 million, a brand new SUV and a recording contract worth millions. All the six finalists received what could best be described as “take-off grants” from MTN, the telecommunications giant. It is noteworthy that all the telecommunication multinationals in the country are doing their best to outdo one another in assisting Nigerian youths in music and sports. Glo’s X Factor has a winner’s tag of N24 million! Are you kidding me! No wonder a great percentage of the youth in Nigeria has taken to music to the detriment of their books. The question is why should any youth study and end up as employees when they can make millions as teenagers from music? The Brand Ambassadors of blue chip companies in Nigeria are music, football and Nollywood stars. They earn millions from these endorsements just for the right to use their names and pictures. Even the Federal Government just joined the bandwagon by giving out national awards to the Under-17 team that won the last World Cup. Before somebody tags me “bad belle”, I believe whole-heartedly that these awards and returns are well deserved and in proper order. However, we need to realise that young people’s view of success is often shaped by the society. If the Nigerian society is passing the signal that to be recognised means you have to be able to croon like Olawale, dazzle with the ball like Iheanacho, be a screen star like Omotola or crack peoples’ ribs like Julius Agwu, then we should be ready to have in our hands the challenge currently being faced by African-Americans in United States of America. In the U.S., blacks dominate sports and music. I was watching Eminem on TV recently and in my view, it looked so out of place to see a white man rapping. Naturally, you will expect to see a black face moving those hands up and down. That is how it has been in America. The whites go to college while the blacks do the odd jobs while trying to succeed as a musician, basket baller or footballer. This trend has become worrisome to some observers such as Ben Carson (the author of “Gifted Hands”). Ben Carson was the first black medical director of John Hopkins Hospital in America. He was the first neurosurgeon to separate twins co-joined at the head. He realised that having blacks focusing on music and sports to the detriment of academic pursuit will create an imbalance that will not help the American Society. Ben Carson came to this conclusion when he read a research paper attesting that out of 22 countries, United States was 21st in appreciation of mathematics and science! He also observed that in American schools, cases of trophies won by students in sport competitions are displayed while the best students in academics are awarded pin or certificates! Ben Carson was not only concerned, he did something about it. He started the Carson Scholarship Fund in 1994 which gives out scholarships to promising students. To date, the fund has given out more than five million dollars in awards. Back to Nigeria, the country has started reaping the fruits of neglecting her brilliant students. This year’s Senior Secondary Certificate Examination (SSCE) result is one of the worst ever and I have observed that this has been the trend for about 10 years now. It is left to be wondered by those who should know in the country if there is any correlation between the failure rate in SSCE over the last decade and the boom in teenage/youthful incursion into the Nigerian music scene within the decade. The Nigerian music stage is practically overcrowded with stars and wannabees simply because the industry pays mega bucks if you “blow”. Young people are rushing to film auditions and comedy competitions because the future is guaranteed if you work hard and make it to the top. Why then is the same environment not created for our academic stars? 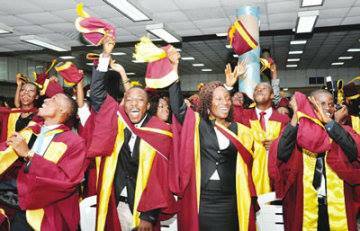 Why are these multinationals not making first class graduates their brand ambassadors? A student has nine distinctions out of nine subjects in SSCE and he or she has no pecuniary rewards? Are you kidding me? A teenager can sing, you give him N24 million. Another teenager excelled academically, you give him a handshake! I find rather disturbing that the Nigeria media and public in general missed out a key fact in the story of Joshua Kunle Abdul-Azeez, the 17- year-old boy who was allegedly maltreated by the staff of Egypt Air on his way to Ukraine. The boy’s wish to travel to Nigeria was granted by her mother after he met the condition of making a five-point CGPA! Every article I have read on the case has been dwelling on the injustice doled out to the boy but none has recognised the fact that this boy is an academic wonder that should be nurtured by the country for future national contribution and development. I won’t be surprised if Ukraine gives him citizenship and appropriate him as a national asset. Prof. Wole Soyinka has permanently relocated out of Nigeria, breezing in once in a while to give us a glimpse of what we lost. Prof. Chinua Achebe spent his last days where he was appreciated the most, United States. Philip Emeagwali excelled because America gave him everything he needed to shine. While we continue to reward the youth in the glamour professions, it is imperative for us to realise that no nation is built on music and sports alone. India is ahead of Nigeria in film making, yet the leading banks in Nigeria used banking applications developed in India. A lot of the tricycles in Nigeria are imported from India, not to talk of the drain on our naira due to Nigerians ‘medical tourism to India. In fact, despite Bollywood, India is a nuclear power! Brazil is another country that is known primarily for soccer. The country has produced soccer greats such as Pele, Ronaldo, Ronaldinho, Zico and Rivaldo to mention a few. Though England is officially credited with the creation of the game, Brazil is globally accepted as the face of soccer. Despite the country’s fanatical obsession with soccer, Brazil is gradually closing the gap on China and India through deliberate diversification of the economy. The country has a strong manufacturing base producing millions of tonnes of steel and cement coupled with electronic gadgets and petrochemical products. Scientific and technological development projects in Brazil attract annual foreign direct investments of $30 billion. The growth in the agriculture and mining sectors has also resulted in trade surpluses. Brazil and India could not have been where they are if there was no deliberate plan for sustaining the interest of young people in sciences, engineering, management sciences, arts and other fields of study. Imagine an India where everybody is in Bollywood or a Brazil where everybody is a soccer star! Nigeria has to get this right for the sake of future generations. Medical doctors are going on protest strikes after years of sacrifice in medical school. I met a medical doctor who was struggling to raise money for his wedding. He admitted he regretted studying medicine for 10 years. Nollywood stars fly plane-loads of guests to Dubai for their wedding. Engineering graduates are ending up as bankers’ employees or at best IT/ICT professionals. The junior ones of these graduates seeing what their elders who were bookworms are going through will most likely make the “informed” decision of trying to be the next megastar. If most of our youths play football, sing, act or crack jokes, who will build the bridges? Who will design the roads? Who will take care of sick people? Who will refine the crude oil? Who will write the computer programmes? Who will make the drugs? Who will market the goods and services? Who will plant the crops and rear the animals? In short, who will be left behind the books? I hereby call on all the companies currently doling out these fantastic sums to TV personalities to extend the same to bright students in our institutions of learning who are struggling hard to remain in class, paying extreme prices to excel in their studies. Imagine the impact if there is a competition in Nigeria in which all Engineering First Class graduates in Nigeria will compete on the most innovative product design and the winner goes home with N50 million! Imagine the interest in engineering studies that will be created. Imagine the impact on the study culture of the youths in this country. Imagine the impact on the quality of life of Nigerians. Imagine what would happen in subsequent SSCEs if one multinational decides to make the best SSCE student in 2014 its brand ambassador? I have no doubt that the pass rate in the examination will increase by at least 300 per cent! With what I know about human psychology and the practical experience I had while teaching, I have come to the conclusion that there is virtually no dull student. What is often lacking is the motivation to study hard due to the absence of a reward or encouragement from parents and teachers. I have tried this assertion on a student tagged “dull” by family and teachers and the boy started passing his papers. Mountain of Fire and Miracles (MFM) Church has set a good example for religious bodies and corporate organisations by giving out brand new cars to First Class graduates in the denomination some time ago. The General Overseer being a First Class graduate himself recognised the need to reward these exceptional youth who achieved exceptional feats. I hereby use this medium to encourage the denomination to continue this programme as I have not read of subsequent recognition given to First Class graduates (or did I miss it?). I also call on the government of this great country to do more in making academic study attractive to the youth. If the reward system is adequately structured such that young ones know they can read their way out of poverty, the youth will be better motivated to study harder. The youth of this generation are discerning, they know which professions pay the bills. • Akindiya is a chartered accountant.